Every week, Global Football President & Founder Patrick Steenberge sits down with his favorite target from back in his playing days – tight end Mike Creaney – for a podcast titled The Genuflect: Irish Football with Creans & #11. This is a West Neck Films production. Please check back here each week for the latest episode. Here we are good enough to win ’em all so far, 12 – 0. Our boys have shown a lot of grit. Is this our best regular season record ever? Bring on the best out there. As we look back on a great season so far, we are joined once again by our #10 Darryll Dewan. Darryll is proudly carrying our flag in Trojan country. So we hope you enjoy our 14th episode of our second season. And we thank you for listening in to our humble podcast, The Genuflect with Creans and #11. Welcome to Season 2, Episode 13 of The Genuflect with Creans and (this week) without #11. Black Wednesday travel problems dammit. Number 11 sends his best, likes ND but is very cautious about it. We have special guest #39 Danny O’Toole onboard this week. Amazing how many positions he was called on to play. Creans references a famous ND – USC brawl. Glad to provide it for those listening on video-able devices. One can find #91 in the action. Number 11 must be under the pile. Enjoy Black Friday. 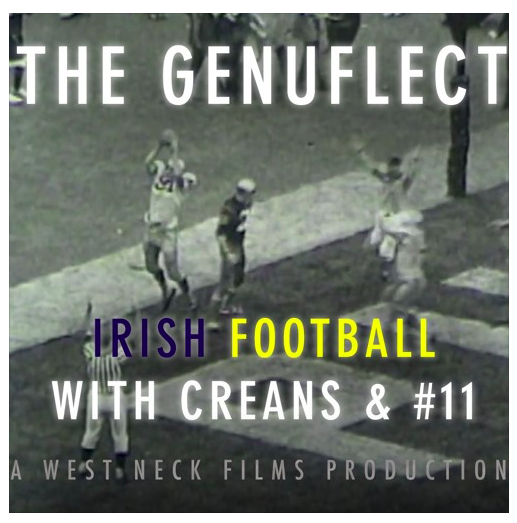 Today we are excited to release Season 2, Episode 12 of The Genuflect with Creans and #11. Turned out to be a cakewalk against Florida State, not like the old days; but what do the Orange have in store? One of our producers warns of an upset. Just hope those ridiculous uniforms don’t jinx the Irish. Black helmets… are you kidding me?? Today we are steeping in tradition. Consensus All American, Team captain, College Football Hall of Famer, our iconic go to man – #44 Thom Gatewood. This episode is a long one, 45 minutes or so; But Thom has some revealing stuff about his experiences in recruiting, his years at ND, and some family stuff you’ll find pretty exciting. Hope you like it. Please, get back to us. Thanks. Pesky Wildcats got a little scary down the end but talent and brawn prevail. Is this a trap game coming up? Nah. Anyway very special treat here with our guest. Joining Patrick and Mike is our legendary #87, Consensus All-American, NFL five time ProBowler and Hall Famer Dave Casper. You’re going to love this. Welcome back ND faithful, fans and friends. After a strong win over the Middies it’s back to another long time rival with special significance. Hear some personal recollections and actual history of the ND rivalry with what we used to call the Purple Haze – The Northwestern Wildcats.. This one is a little long but worth every minute. Joining Pat and Mike this week we are thrilled to present another proud national champion from ’73, #40 Gary Potempa – he’s really funny. Enjoy! Heading to San Diego to meet ND’s steadiest and classiest rival over the last 70 years, the Midshipmen of the U.S. Naval Academy. This week we’re pleased to have a very special guest join Patrick and Mike, ND captain and National Champion, #14 Steve Orsini. Quite a road our Steve has traveled since that ’77 championship season. Sit back and enjoy the stories and analysis. Thanks for tuning in. Send us your thoughts and feedback. Hello ND Football fans. We are proud to bring you Season 2 Episode 8 of the Genuflect with Creans and # 11. Nice to have a bye week while sitting at 7 & 0 and in the playoff mix. After last week’s technical difficulties – remember, our producer was an English major – we’re proud to have an ND linebacker with a National Championship ring, and eight children! Number 42 Tim Sullivan ’74 joins Creans & No. 11. Enjoy. Comments and stories welcome. Another week with Creans & #11. Remembering friend and teammate, Greg Marx this week. Well how ’bout that. Well balanced win against a top ten team. Snapped the Stanford jinx at home. We’re proud to present Creans and #11, along with another ND QD Evan Sharpley. Great analysis. Enjoy episode 6. Comments and stories welcome. Thanks for joining us again. This week we’re proud to present our #16, Ken Schlezes. He joins Pat and Mike with some great recruiting stories and game analysis. We value your comments and stories. Enjoy. Creans & 11 talk Catholic vs. Convicts as the Irish gear up for a ‘do or die’ in Miami this weekend. This one’s on Moose. The Irish keep rolling. Another week with Creans & 11. Another week with Creans & 11 – they talk Southern Cal and lay out what the rest of the season looks like for the Irish. Mike Creaney and Pat Steenberge talk Irish football.